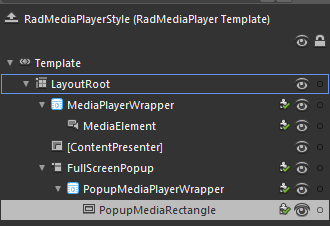 This topic will explain you the structure of the RadMediaPlayer template and will describe the elements in it. LayoutRoot - a Grid control that represents the main layout control in the RadMediaPlayer's template. LayoutRoot - a Grid control that represents the main layout control in the RadMediaPlayerWrapper's template.